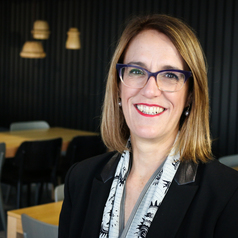 Jane Martin, BA (Hons), MPH, Hon Doc (Deakin) is Executive Manager of the Obesity Policy Coalition (OPC) and of Alcohol and Obesity Policy at Cancer Council Victoria. The OPC is a partnership of Cancer Council Victoria, Diabetes Victoria and the Global Obesity Centre at Deakin University - a WHO Collaborating Centre for Obesity Prevention. In her role at OPC, Jane advocates for policy and regulatory reform to prevent overweight and obesity, with a focus on food marketing, labelling, and tax and pricing measures. For over twenty-five years, Jane has worked extensively in public health advocacy, first in tobacco control then in obesity prevention and alcohol policy. Her interests lie in advocacy, policy oriented research and using evidence informed arguments for policy reform. She has published a number of book chapters, papers on tobacco control and obesity prevention policy, and regularly speaks at national and international conferences. She is active in the media together with other related advocacy initiatives. She was a member of the Expert Committee on Obesity for the Australian Government’s National Preventative Health Agency and was, until recently, a Board member of Family Planning Victoria. Currently she is a member of the National Advisory Group for the Parents Voice and Vice President of the Australia New Zealand Obesity Society and Co-Chair of the National Alliance for Action on Alcohol. She was awarded an Honorary Doctorate in 2018 from Deakin University for her work in advocacy, particularly prevention of childhood obesity. In 2011 Jane was awarded the Jack Brockhoff Foundation Churchill Fellowship to study advocacy strategies to prevent obesity and in 2013 she completed the Williamson Community Leadership program.